When I graduated from law school in 1956, I was fortunate to be able to join my dad, Benjamin Roth, in his Youngstown, Ohio, law practice. By that time he had been a lawyer for thirty-seven years, and following the end of the Depression, he had developed a substantial clientele as a sole practitioner. As a new lawyer, I had no clients of my own and therefore devoted all of my time to working with my father’s clients. 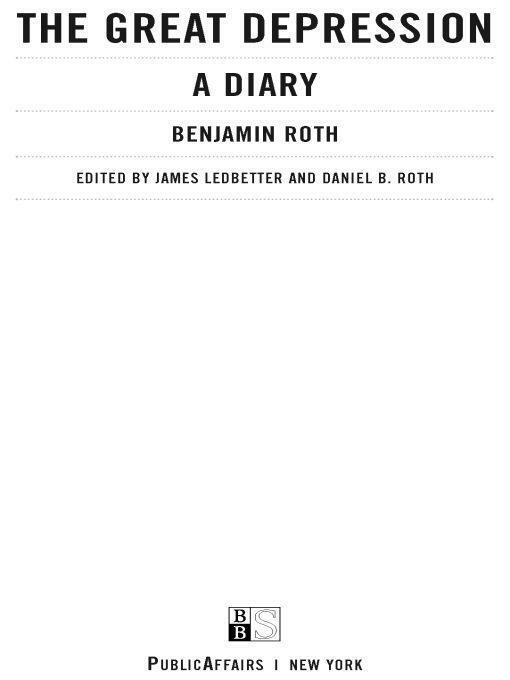 That is when I first learned that he had maintained a detailed diary of financial issues throughout the 1930s. My grandfather Samuel Roth had come to this country in 1877 and settled in Manhattan, where Dad was born in 1894. The family relocated to Youngstown, Ohio, in 1900, and Dad attended the local schools. He then earned his undergraduate and law degrees at what is now known as Case Western Reserve University in Cleveland, Ohio, where he helped pay his college expenses by playing the violin in the orchestra pits of the local silent movie theaters. While in law school, he met my mother, Marion Benjamin, a student at Oberlin College. Immediately following his graduation from law school, Dad was sworn in as a lieutenant in the U.S. Army and joined his three brothers on active duty during World War I. At the end of the war, which coincided with my mother’s graduation from Oberlin, my parents were married in Cleveland. In 1919 my folks settled in Youngstown, where my father opened his law office. A year later my sister, Connie, was born, followed five years later by the birth of my brother, Bob; I entered the family in September 1929 (thereby causing the entire stock market to crash, according to my parents!). I recall little before 1934, though I clearly remember that my parents constantly discussed money problems and “pinched” every penny. When I was six or seven years old, I fell and cut my forehead. As I lay on the sofa, bleeding badly, my mother phoned my father (yes, we had a phone) and asked whether we could afford to have a doctor come to the house (no, we had no car). My father called a doctor who was one of his clients. The doctor made the house call and patched me up—but then refused any payment because of my father’s having provided some legal services for him without charging a fee. 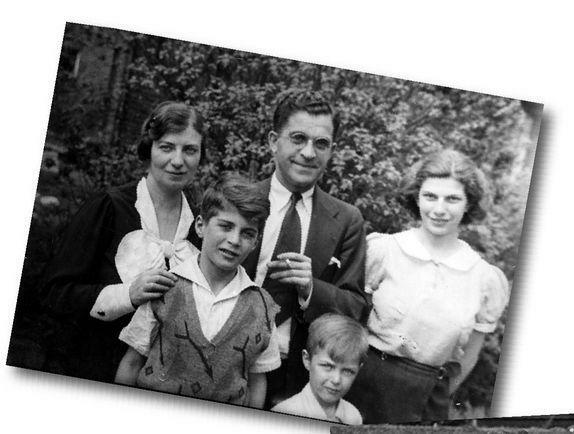 Benjamin Roth gathers with his wife, Marion, and three children, daughter Connie and sons Daniel and Bob, in 1935. 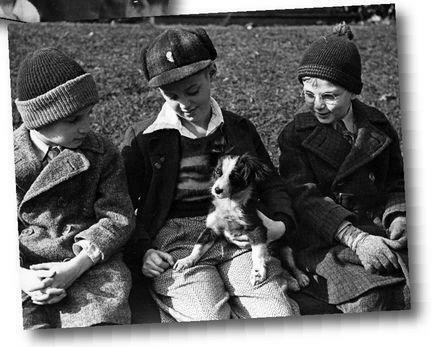 Dan Roth plays with his two cousins, Jim (left) and David (right) Elliott, and his dog, Puddles, in Youngstown, Ohio, in 1936. 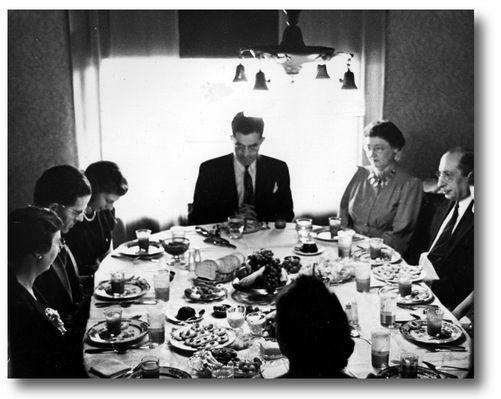 Benjamin Roth hosting Thanksgiving dinner with his family in 1937. Seated at the table (from left to right) are Benjamin’s sister-in-law, Roma Elliott; his brother, Morris Roth;, his daughter, Connie; Benjamin himself; his mother-in-law, Irene Benjamin; his father-in-law, Morris Benjamin; and his wife, Marion Roth. I have many fond memories of growing up in the 1930s, even as terrible as those years were. My mother taught piano lessons at home, and on most evenings our family would perform “concerts,” gathering around Mom’s piano with Dad playing the violin and we three children singing. On warm summer evenings, my parents would open the front door, and many of our neighbors would sit in our living room or on our front porch and join in the fun. Those were the days of simple pleasures; there was no need to spend money or to own a car. In retrospect, I realize that throughout their entire married life, my parents always lived within a short walk of the bus line, and even in his eighties my dad would leave his car in the garage and ride the bus to and from the office. When I first began to work with him, I offered to drive him downtown, but he refused, explaining that he enjoyed getting to know the other passengers, many of whom became his longtime friends. In 1937 Dad purchased a new car, his first since selling his old one in 1932; my sister, Connie, left for college; and the country entered into a second deep depression. I can clearly recall my parents discussing whether they would be able to afford to keep Connie in college (there were no student loans in those days), and they finally told her to take one semester at a time and they would do their best to keep her in school. Their “best” was good enough, and Connie received her teaching degree and ultimately became a highly respected teacher in Boardman, Ohio. As I read through this period in the diary, I am amazed by my father’s determination to learn as much as possible about economic issues. 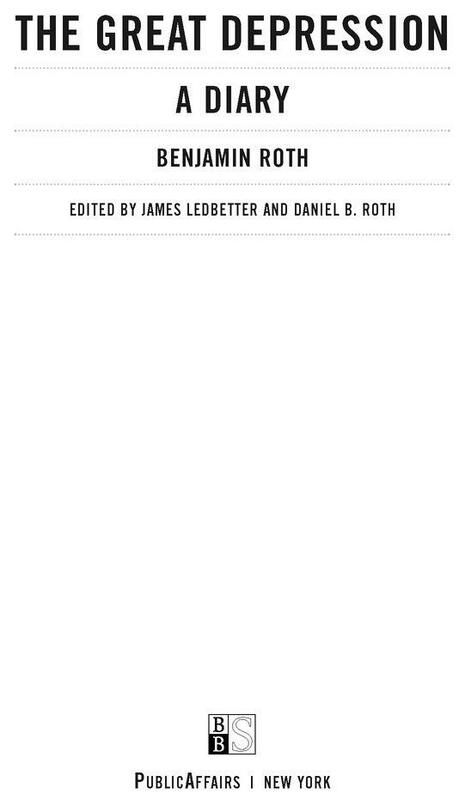 In fact, in spite of his financial hardships, he frequently writes about how grateful he is for the “post-graduate” education afforded him by the Depression. He often expresses his unquestioned belief in America and our capitalistic system as well as his conviction that conditions would ultimately improve with the result that we would be a stronger nation without changing to a communistic or socialistic society. Most of all, I gained tremendous respect for the strength and endurance displayed by both of my parents during those difficult years. Dad was not the type to lecture, though. He taught by example. By the time I was in my early teens, Youngstown’s steel industry was booming again, and racketeers were getting rich on illegal gambling. Dad and two other men decided to run for city council on a platform of cleaning up the rackets. All three were elected, and they succeeded in driving the illegal gambling out of town (the racketeers simply opened up a gambling resort just outside the city limits called the Jungle Inn, which was ultimately closed by state and federal officials). Immediately after he was elected to office, he received a number of “gifts,” including free passes to all of the movie theaters. I was thrilled with this and could hardly believe it when Dad promptly returned all of the “gifts” with polite thank-you notes. When I complained to him that we should keep the movie tickets, he simply explained that honesty and integrity are not matters of degree. My family survived the Depression and the war that followed. In 1943 Bob began his college education at Oberlin, but then joined a program with the U.S. Navy that resulted in his receiving his bachelor’s degree from Harvard. After serving as a naval officer, he earned his law degree from Columbia and became associated with a Manhattan law firm. By 1951 my parents’ lives had finally calmed down, and they were beginning to prosper. I had received my bachelor’s degree and was serving on active duty as an air force lieutenant during the Korean War when their lives fell apart again. I was called home on an emergency leave to attend my brother’s funeral. Even though more than fifty years have passed, I can still remember my parents’ grief. It took years for my parents to put their lives back in order, only to then watch my sister, Connie, die at the age of fifty-three.